Asus has rebadged its tablets as Transformer Pads – and introduced The Transformer Pad Infinity series and the 'young, trendy' Transformer Pad 300 series. Boasting that the Transformer Pad Infinity series offers up the world's first 4G LTE/3G/Wi-Fi tablets, Asus' latest baby's specs certainly are impressive. There's a 1920x1200 Full HD Super IPS+ display rated at 600 nits, which Asus is hoping will draw in audiovisual enthusiasts, especially given the SonicMaster tech. "The 4G LTE model comes armed with the powerful Qualcomm MSM 8960 Snapdragon S4 Krait Dual-core 1.5Gh processor and is capable of download and upload speeds of up to 100Mbps and 50Mbps respectively," adds Asus. Also on offer is second-gen Gorilla Glass, an 8MP rear-camera (and 2MP snapper for the front) and LED flash; it's on Android 3.2, but apparently upgradeable to Android 4.0. Design-wise we're looking at 8.5mm thickness and the same metallic finish as the Tansformer (Pad) Prime. The Transformer Pad 300 series has been targeted at the "young and trendy, tech-savvy set who are looking for more individuality, value, and performance in their tablet." Before you run for the hills, the tablet will allow you to reflect your individuality and personal style - as long as that is reflected by the colours blue, white or red. 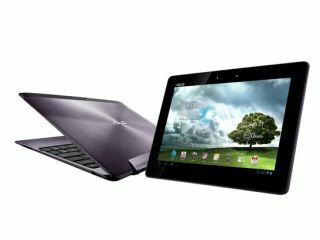 Specs wise, the 4G LTE model is, the company claims, the world's first quad-core 4G LTE/3G / Wi-Fi tablet, and features an Nvidia Tegra 3 quad-core processor and Android 4.0. There's also the ASUS SonicMaster technology, a 1.2MP front camera for video conferencing and an 8MP rear camera with a large F2.2 aperture and 5-element lens which allows for high quality images along with 1080p HD video recording.